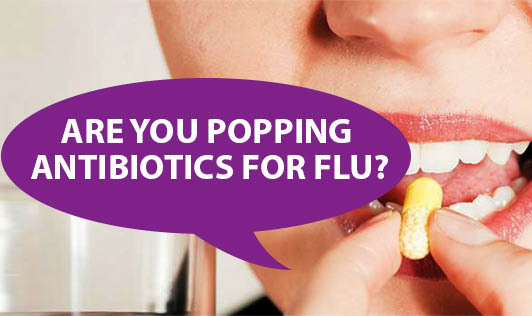 Are You Popping Antibiotics for Flu? Are you in the habit of popping antibiotics each time you are down with cold or flu? Don't. Antibiotics are meant to kill bacteria that attack your body. Illnesses like tuberculosis, cholera, leprosy, diphtheria, typhoid are caused by bacteria. On the other hand, illnesses like common cold, influenza, chicken pox, hepatitis, measles, herpes zoster, etc. are caused by viruses. Antibiotics have no effect on viral infections. Since the medications for each infection act in different ways, there's no point in taking medicines to fight one infection when they are actually meant for another. Antibiotics do not fight viruses. If you repeatedly take antibiotics each time you have a cold, sore throat or flu, it might lead to other problems. Do not use antibiotics when they are not needed and do not overuse antibiotics for any illness. Do not self-medicate. Do consult your doctor when you are ill and take only the prescribed medicines for the given period of time.